Detail : Paul's tenth "solo" release, credited to "Wings". Obviously, this features a variety of Wings line-ups, see individual entries for clarification. After being once again back down to a trio, in 1978 Paul augmented the band with Steve Holly and Lawrence Juber. But as this new set-up required rehearsal, and no new album was ready, Paul prepared a collection of hit singles for the Christmas market. 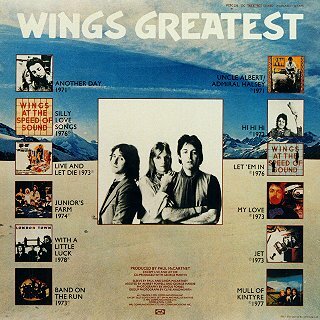 Of course, two of the tracks were not by "Wings", and one of them (Uncle Albert) had not been a hit single either in this country. The album fared fairly well, but only managed to reach number 5 in the chart, although it was listed for over seven months ! It was even promoted by T.V. advertising for two weeks before Christmas, but even this didn't help it's push to the top. Paul shouts out the window, "You're a bit flat mate !". The driver leans out his window and says "Funny, I only checked them this morning". The sleeve design was by Paul and Linda with assistance from Aubrey Powell and George Hardie of Hipgnosis, and photography by Angus Forbes. Linda had bought the model of a flying lady, and had it flown to the Alps on 14th October 1978 for the photographs. A snowdrift was created and the 24" statuette of Demetre Chiparus's, Semiramis was photographed for the cover. The inner sleeve is plain black with a very small picture of the front cover statuette taken from front and back on each side of the sleeve. The statuette also appears on the labels. Free within is a 30" by 20" poster, with a colour scene on one side, and a black and white picture of the trio taken by Clive Arrowsmith on the reverse. Silly Love Songs McCartney 1976 track from Wings At The Speed of Sound, and 1976 single. Live And Let Die McCartney 1973 single, James Bond film theme, and album track. Junior's Farm McCartney 1974 single. the 45 was flipped when Hi Hi Hi was banned. Let 'Em In McCartney 1976 track from Wings At The Speed of Sound, and 1976 single. My Love McCartney 1973 single, and Red Rose Speedway track. Jet McCartney 1973 track from Band On The Run L.P., and 1974 single. Mull Of Kintyre McCartney-Laine 1977 single. 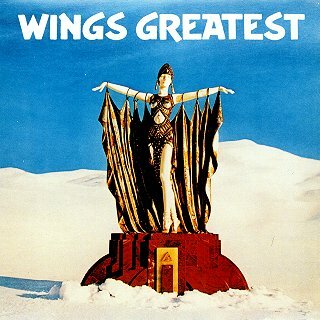 Further Issues of "Wings Greatest"
There is also a cassette version released on the initial release date, TCPCTC 256. January 1985, the next listing is on the Parlophone label, ATAK 15 (+ TCATAK 15). It includes no bonus tracks. and still has no bonus tracks. ©2001 JPGR's Beatles Pages. All Rights Reserved.